Flecken Steyerberg, one of Germany’s centres for the production of natural gas, is giving full backing to energy change with a whole package of measures and projects. Steyerberg has already achieved 21-fold self-sufficiency in private households through locally generated renewable electricity. So that citizens on site might also participate in income from RE electricity production, an energy cooperative was founded with the help of the commune. In one part of the town, the citizens are the operators of an RE local heating network and more networks are planned. For decades, rural Steyerberg has already attracted attention in a positive way with innovative projects for energy change and the transport revolution. 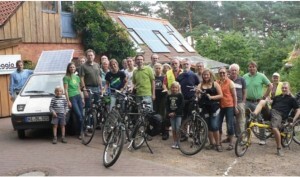 Thus, for example, the first solar service station in Lower Saxony was built in the “Lebensgarten” eco-housing estate. It still exists and is being constantly refined. Particular emphasis is placed here on car-sharing with electric cars, which is unusual for rural environments. With regard to innovation for industry and businesses, conversion to wind power for industrial users with large-scale technology is being planned. To keep the wider public fully informed about energy change in Steyerberg and the surrounding area, the Energy Discoverer Route was created jointly with neighbouring communes. At numerous individual stations such as the solar service station, locals and touring cyclists get comprehensive information on-site regarding renewable energy projects.